WASHINGTON (The Nil Admirari) - Today, Democratic presidential candidate and former Secretary of State Hillary Clinton ignored all questions from the Select Committee on Benghazi, which infuriated Republican committee members. Rather than listening to and answering questions, Clinton gave the whole event very low priority and sat calmly in her chair as she read a children's book by the name of "The Pet Goat." "I don't know what you are reading, Secretary Clinton. It certainly seems more important to you than threats to national security, protecting Americans, and responding to a crisis in a timely manner," stated a red-faced Rep. Trey Gowdy (R-SC-04), the chairman of the kangaroo committee. 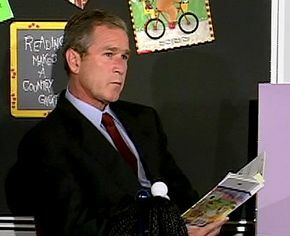 President George W. Bush enjoying "The Pet Goat" on 9.11.2001. A frustrated Gowdy continued, "It was your job to make sure Americans were safe. Why didn't you give our people in Benghazi more security to protect them? Hello? Secretary Clinton? Are you even listening to me?" An aide to Secretary Clinton whispered something in her right ear, which caused Clinton to look up at the committee for a moment before returning her undivided attention to "The Pet Goat." "Secretary Clinton, why you didn't you take the Benghazi attack seriously and save our people?" inquired Rep. Jim Jordan (R-OH-04), a member of the Freedom Caucus. RELATED: Benghazi Chair Gowdy Practicing Phrase "I Plead the Fifth"
Jordan abruptly took off his left shoe and banged it on the table in front of him before asking, "Secretary Clinton? What are you reading? Are you even listening to us?" Rep. Gowdy threw his hands up in the air before calling a recess just prior to 1:30PM, and vowed to get Clinton to acknowledge his existence.